You turn off the freeway and hope to find a toilet, quick. If not, at least a bush or deep ravine. This time we found a sketchy gas station that Time forgot. I think the Heath Department forgot it too. It had one of those unisex bathrooms you enter from the outside that you have to beg the cashier for the key to open. We all held our noses and took turns using it. We were lucky the toilet still flushed, but there was no hand soap. I reminded my kids to put toilet paper on the seat and at least to rinse their hands to drown the germs if we couldn’t kill them with Dial. I crisscrossed over the maze of discarded toilet paper squares on the wet floor like I was in a mine field. I remember the overflowing garbage and the dilemma of deciding how to avoid touching the door handle to open it. When we packed the kids back in the car, I noticed my toddler, Rachel, was chewing gum. I never give gum to my toddlers because they usually have no concept of chewing without swallowing. So I knew this was not something I had given her. I asked where she got it, but the look of alarm in my eyes must have warned her of danger. She refused to talk or divulge her sources. We drove away with Rachel still chewing gleefully. Miles later, a sibling wanted some gum too, and asked for some. It was after I said I didn’t have any that Rachel bragged, “I got mine in the bathroom.” The car jolted a bit from my husband stepping on the brake. As more information leaked out, we discovered she found the ABC gum in that germ-infested gas station bathroom. Toddlers are built low to the ground so they see things that we adults miss. I wanted to yank it out and spray Lysol inside her mouth, but realized the damage had been done. What else can a parent do at that point? I’ve heard that every child needs to digest at least 10 lbs. of dirt by the time she is 8 years old to survive in this world. 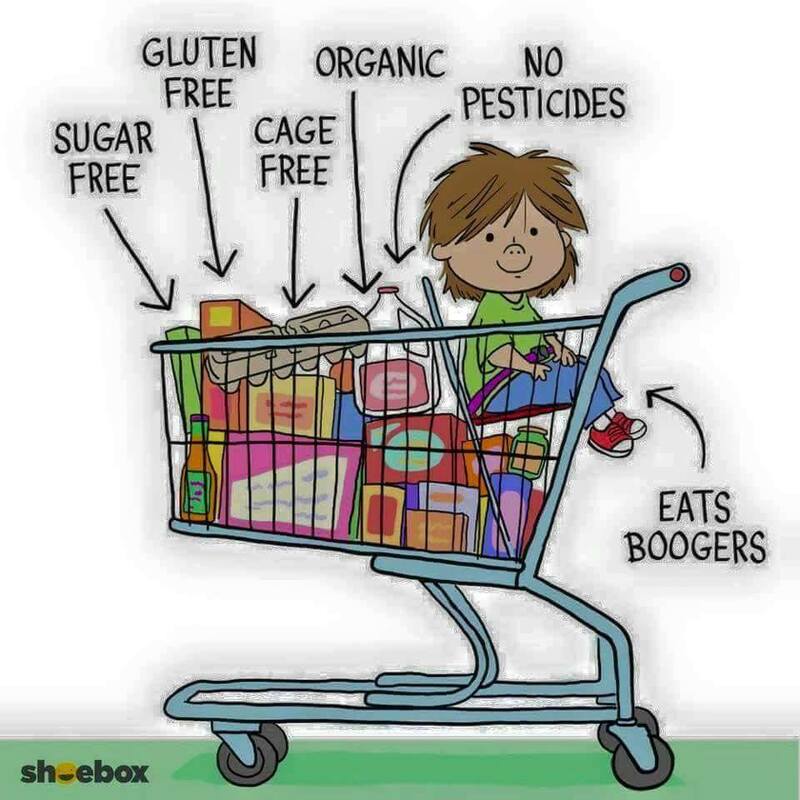 Besides, eating boogers may be the only GREEN food they’ll eat. It is organic, after all. So is poo. Before you rush for the hand santizer, I have to report that Rachel is now 19 and arguably the healthiest of my 5 children. Was it heavy doses of germs early on that made her so robust? With each child, I became more relaxed in my antiseptic approach to parenting. With the first child, if the pacifier dropped on the floor, we boiled it for 5 minutes to de-germ it. By the fifth child, if the pacifier dropped and the dog licked it, I wiped if off on my pants and stuck it back in the baby’s mouth. I recently listened to a radio interview with the co-author of “The Good Gut” which is all about how our bodies are made up of microflora in our digestive systems. We need good bacteria, like ABC gum and boogers, to help our bodies build immunity and fight the bad bacteria. Kind of like inoculating our children against measles. We give them little doses of bacteria every day when we let them play in the sand mixed with cat poo, make mud pies, and kiss the dog. I’m all about diversity. And I’m all about microbiomes because they sound cool. Imagine a bunch of foreign germs, like Goodwill Ambassadors, from Angola, Tonga, Korea, Canada, and Slovenia meeting in your child’s gut, sharing drinks, swapping stories, eating Chex Mix, and playing Charades. When an intruder tries to crash the party, all these foreign friends band together and bar the door. Of course that makes sense. If there’s a party happening in our gut, it’s going to make us feel better all over. Pass the piña colada, please.